This Saturday morning I had planned to meet Dan Sherman up at Rowena, so again woke up at 2:30 am, and drove there. It was clear skies to the east, and cloudy to the west, and when I got out of my car it was very windy and cold. I was certain that the rain would make this morning miserable. Dan hadn’t arrived yet, so I decided to hit the trail and go off to check out the scene. When I got to the location was thought I wasn’ted to shoot, I was again met by Alan Howe who told me I was late. Indeed I was. I had been sitting in my car for several minutes, and I almost made a last minute decision to leave Rowena, and head to the Columbia Hills, because the conditions just didn’t seem like they were going to cooperate. I was happy I stayed. 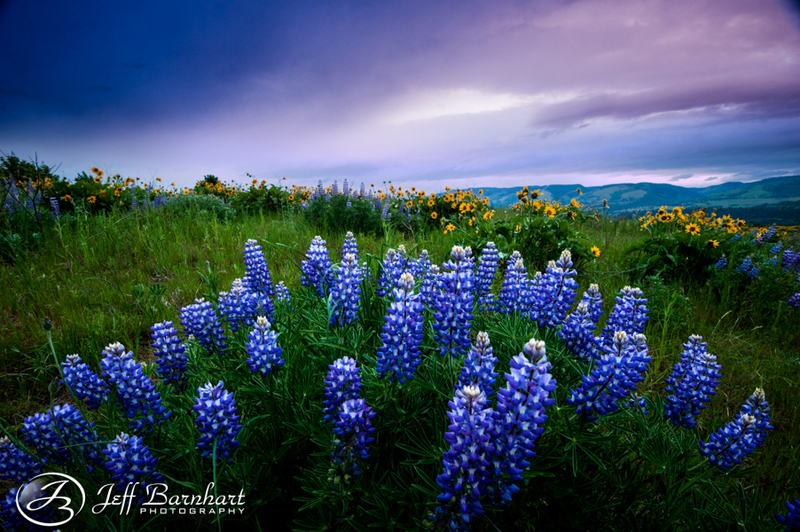 I again found a wonderful bush of Lupine, and right as I got my composition Dan arrived. I took a couple uninspired shots before deciding that a new composition was needed, as I already had a shot with clear skies and a sunstar, so I walk around until I found something new. Now all I needed was for the skies to blow up and make everything magical. Once I was finished shooting this scene, I turned around and hurried up the hill to quickly find a new composition so I could shoot this! And it wasn’t over yet. Dan had found his way to this area as well, and was shooting north when I call his name and pointed west. It was the beginning of a rainbow. I found this terribly difficult to shoot because of my shadow was in the foreground, and the wind was blowing rain directly into my lens. 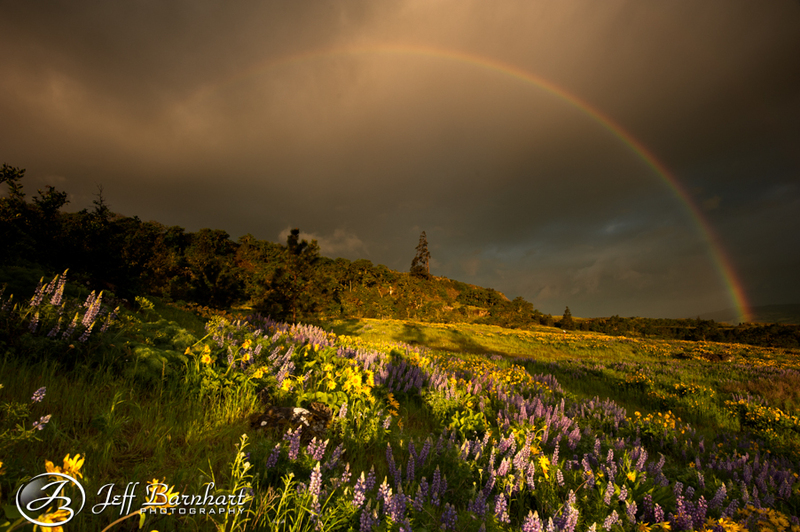 When we were done shooting our shadow with a rainbow in it, we chatted it up with the passing photographers. When Alan came by Dan introduces himself, and as it turned out we all had the same idea on what we wanted to shoot this day, so we invited him to join us, along with both of their wives. 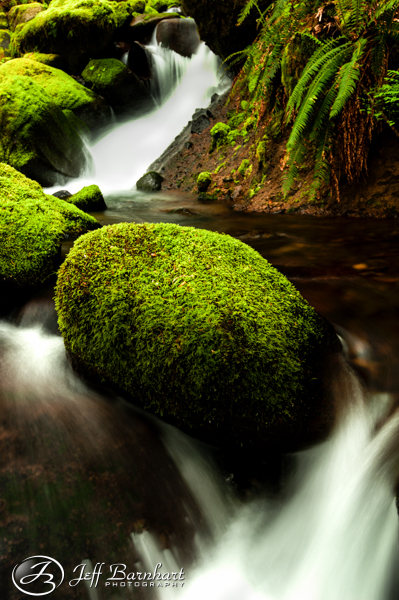 After a wonderful breakfast we headed to the place known as “The Mossy Grotto”. That’s not its real name, and in fact it’s not even a grotto. A grotto is a cave, and that is why I’m effectively renaming it “The Fern Gully”. Yep, this is happening. I had been here before, and remembered it being easier to get to than the instructions I had read online, so when Dan asked me if his two dogs, one with a bad back, could make it down there, I was all, “ya, that shouldn’t be a problem”. Well, here’s the thing. I forgot about one little part where they would need to be handed down, then carried while not slipping down a rock slide. My bad Dan. My Bad. Dan’s wife would return to the car with them, while we continued to the Fern Gully. To all of you that visited this area in the past week, you’re welcome for cleaning this place up. The three of us spent 15-20 minutes just removing dead twigs and branches from the stream before shooting it. We could have spent hours more shooting this scene, but eventually we decided to head to our next destination. 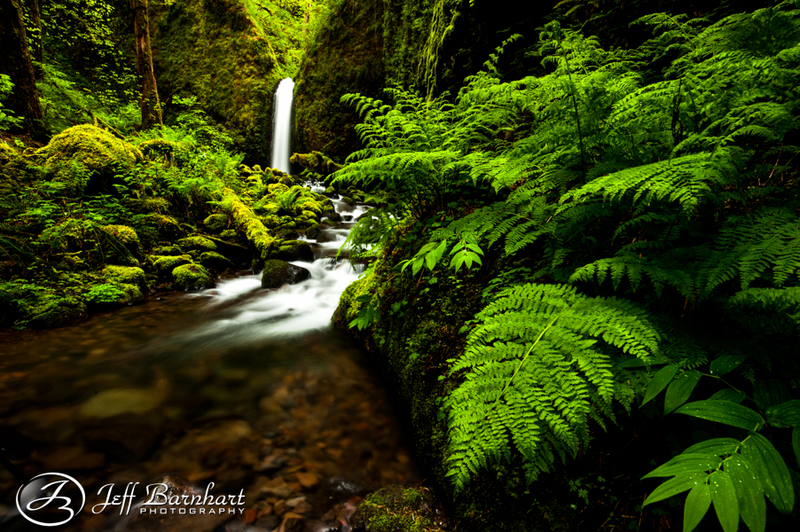 On our way down we stopped to shoot the wonderfully lush Ruckel Creek, and then headed back to the car. 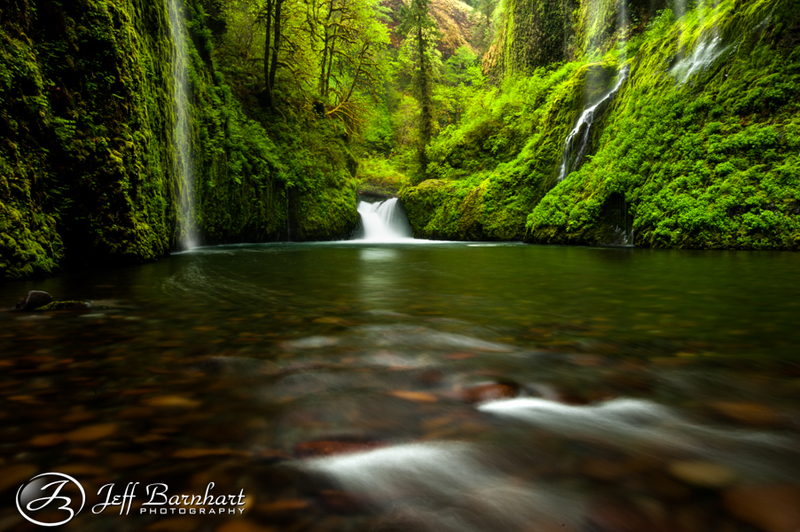 Dan had a couple friends that wanted to join us on our next hike, so we waited about an hour before hiking to Punch Bowl Falls. We also had plans to hike to the Weeping Walls, and Alan had mentioned that there might be a way to get there that doesn’t require any swimming. He had already been there last week and got the shot he wanted so this is where he and his wife parted. 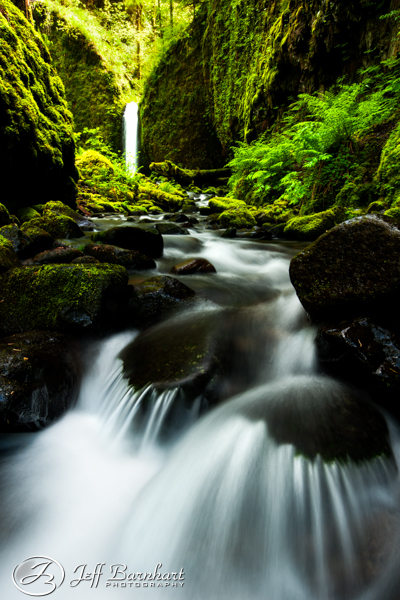 When Dan friends arrived, we moved our cars closer to the trailhead, and when I got out a guy pulled up and asked if I had been to Punch Bowl Falls, and how the water flow was. I told him that the water flow was the least of his problems. I had seen online that another tree had fallen in front of the falls, and this time it had a branch that is so fugly blocking the view of the waterfall, I truly have no reason to visit this here until this tree is washed away. From the looks of it, I can’t image this tree moves for many years, perhaps even decades. Dan friends really wanted to see it, so we made the hike out there anyway. Afterwards Dan and I hurried to find the Weeping Walls so we could still make sunset somewhere in the Gorge. We followed Alan’s instructions and it appears that a trail is starting to form to this place. We did find the path where swimming wasn’t required, but we did have to cross the river several times in waste deep, or deceptively quick moving water. The hike actually reminded me a lot of the hike to the Subway at Zion National Park, and I could see some day there being a clear path there. The hike back was a little trickier. We decided to see how far down stream we could get to find a new way to cross without swimming. Well, we came to a point where if we went any further we would either have to swim, or risk missing our 7:00 pm deadline for when Dan’s wife calls for a search and rescue, so we turned back and found a place where we knew we could cross. I was thinking we’d be back by 6:00 or 6:30 at the absolute latest, so I was glad that Dan said 7:00 because we ended up getting to the trail head at around 6:40. The first thing we did after putting on some dry clothes was take a look at the weather report to determined where our best odds for good lighting would be. 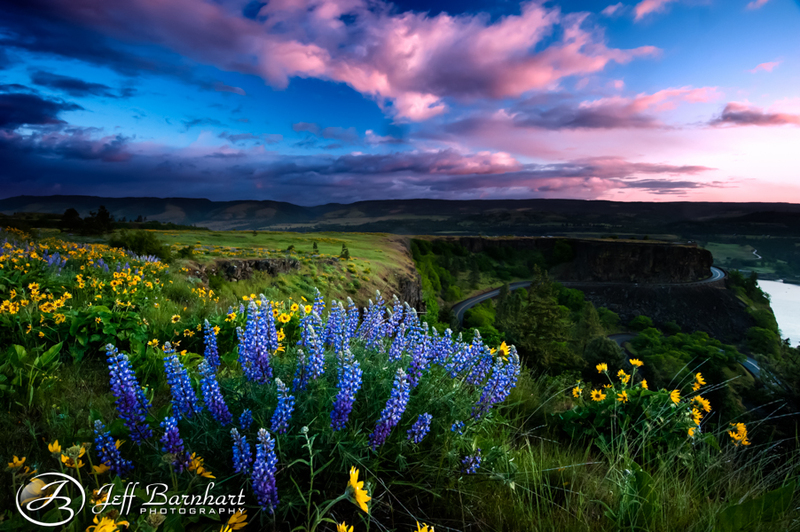 I had wanted to shoot an area of the Columbia Hills that I hadn’t shot yet, but our best chance would be back at Rowena, so that’s where we headed. When we arrived the flowers weren’t looking too great in the area we had chosen, the skies didn’t look too promising, and it was starting to rain a little, but I decided to stick with it and see if there was anything worth shooting. 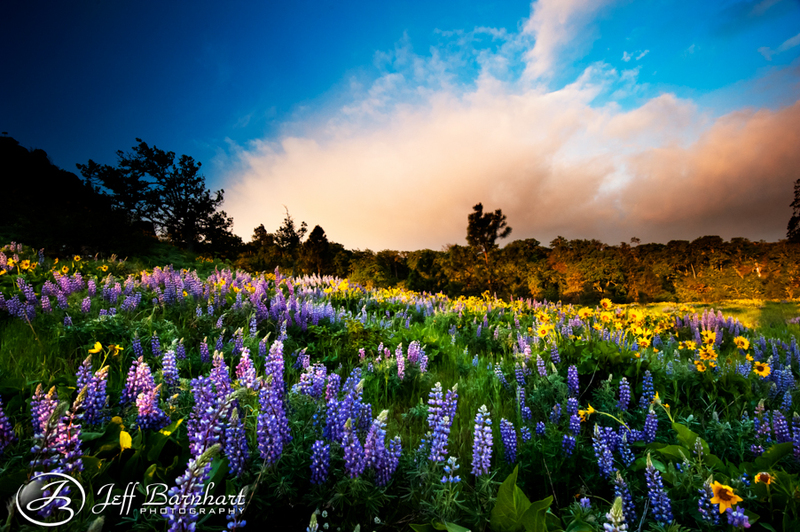 That’s when I found this most perfect bush of Lupine! I told Dan that this bush deserved so much better than these skies, but they actually compliment them quite well! This is as wide of an angle as I could get, and needed it all to fit everything in the frame. Jeff, excellent story telling man. I second the renaming of the Grotto to Fern Gully. Yup, THAT just happened. So it shall be! Also, no worries on the dacshunds. They would've been getting impatient while we spent a ton of time in that awesome place.